World Muaythai Council » Muaythai Heads to Vegas! The new year is just getting started and Triumphant Combat Sports is coming into the year packing the punches. 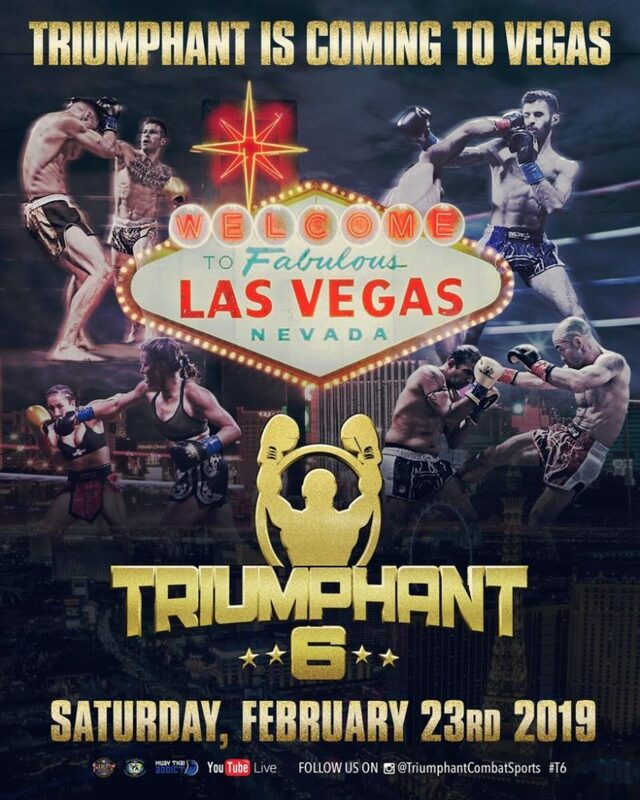 Triumphant which is sanctioned by the WMC will be in Las Vegas February 23rd for Triumphant 6 and April 13th for Triumphant 7. The chips are stacked for the two Vegas shows with Triumphant 7 featuring a WMC title bout between two seasoned Triumphant veterans, Thailand’s Naruepol Fairtex versus the UK’s Liam Nolan. Triumphant 6 will feature Brandol Mendoza vs Brendon Raftery in a southern California battle. Triumphant 6 will feature 5 professional fights along with a stacked undercard of amateurs for full rules Muay Thai bouts. The main event will feature Brandol Mendoza vs Brendon Raftery at 127lbs. The contracts have been signed and both boxers are ready to get into the ring. Brandol Mendoza comes to the bout with four professional fights and has previously appeared on Triumphant. He is looking to make his mark in the professional scene and has been training with David Huey from Muay Thai America Gym in North Hollywood for the last year. Raftery is a former MMA fighter who has switched to the art of eight limbs. Fighting out of Steel MMA this will be his 4th professional bout and 3rd appearance on Triumphant. In his previous appearances he took a win over Ethan Quiachon of Woodenman Muay Thai and a loss to Sean Climaco from Smash Muay Thai. Raftery recently spent two weeks in the motherland of Muay Thai and is excited to go from San Diego to Vegas. This entry was posted on Wednesday, January 23rd, 2019 at 12:43 PM	and is filed under News.